Our new "Rolls Royce" toughening plant has just gone into full production. Toughening (baking glass in oven to make it 4 - 6 times stronger then standard glass) is the industry norm for strength and safety-breaks like sugar. We can toughen glass from 4mm right up to 19mm (EN12150). We also have a quick turnaround time on orders. From glass shelves to shopfronts - we cater for all markets, domestic to industrial. Toughened or tempered glass is a type of safety glass processed by controlled thermal treatments to increase its strength compared with normal glass. Tempering puts the outer surfaces into compression and the inner surfaces into tension. 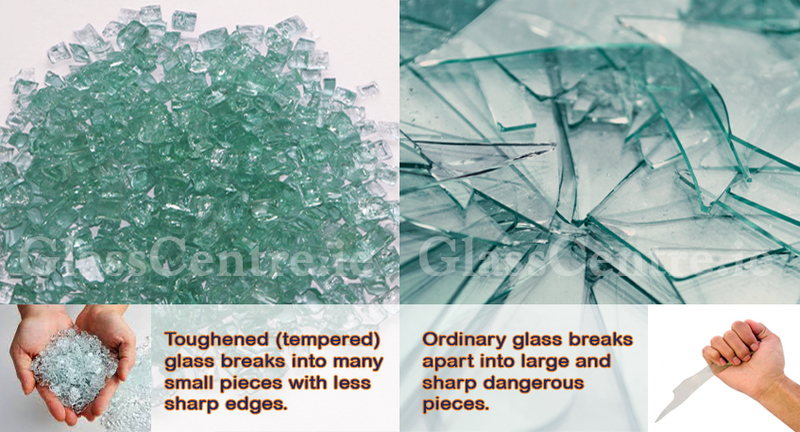 Such stresses cause the glass, when broken, to crumble into small granular chunks instead of splintering into jagged shards as plate glass (a.k.a. annealed glass) creates. The granular chunks are less likely to cause injury. As a result of its safety and strength, toughened glass is used in a variety of demanding applications, including glass for windows, glass for doors, shower doors, architectural glass doors and tables, passenger vehicle windows, refrigerator trays, mobile screen protectors, as a component of bulletproof glass, for diving masks, and various other applications. 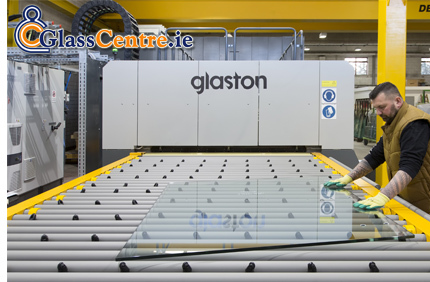 Toughened glass is 4 to 6 times physically and thermally stronger than regular glass. The greater contraction of the inner layer during manufacturing induces compressive stresses in the surface of the glass balanced by tensile stresses in the body of the glass. 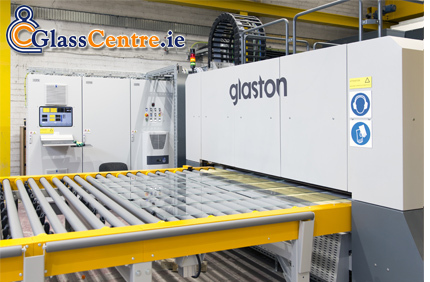 Toughened glass is made from annealed glass via a thermal tempering process. The glass is placed onto a roller table, taking it through a furnace that heats it well above its transition temperature of 564 °C (1,047 °F) to around 620 °C (1,148 °F). The glass is then rapidly cooled with forced air drafts while the inner portion remains free to flow for a short time. Francois Barthelemy Alfred Royer de la Bastie (1830–1901) of Paris, France is credited with first developing a method of tempering glass by quenching almost molten glass in a heated bath of oil or grease in 1874, the method patented in England on August 12, 1874, patent number 2783. Tempered glass is sometimes known as Bastie glass after de la Bastie. In 1877 the German Frederick Siemens developed a different process, sometimes called compressed glass or Siemens glass, producing a tempered glass stronger than the Bastie process by pressing the glass in cool molds. The first patent on a whole process to make tempered glass was held by chemist Rudolph A. Seiden who was born in 1900 in Austria and immigrated to the United States in 1935. Though the underlying mechanism was not known at the time, the effects of "tempering" glass have been known for centuries. In about 1660, Prince Rupert of the Rhine brought the discovery of what are now known as "Prince Rupert's Drops" to the attention of King Charles II. These are teardrop-shaped bits of glass which are produced by allowing a molten drop of glass to fall into a bucket of water, thereby rapidly cooling it. They can withstand a blow from a hammer on the bulbous end without breaking, but the drops will disintegrate explosively into powder if the tail end is even slightly damaged.